As they say in the world of travel, “getting there is half the fun”, and this idiom rings especially true when it comes to road trips. 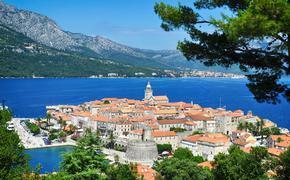 The highways of America present endless opportunities for pre-destination diversions. While most are simple stops by the side of the road, other pit stops are a bit more on the peculiar side of things, and these are the ones that make the best memories. The passion project of folk artist Leonard Knight, Salvation Mountain is one part paint and cement-covered pile of junk and one part kaleidoscopic wonder-hill. Featured in the movie Into "The Wild" and a myriad of music videos, this man made mountain attracts gaggles of visitors every day to gaze upon its rainbow of contours full of inspirational religious quotes. The vibrancy of the colors contrasting against the desert backdrop make this place truly special. 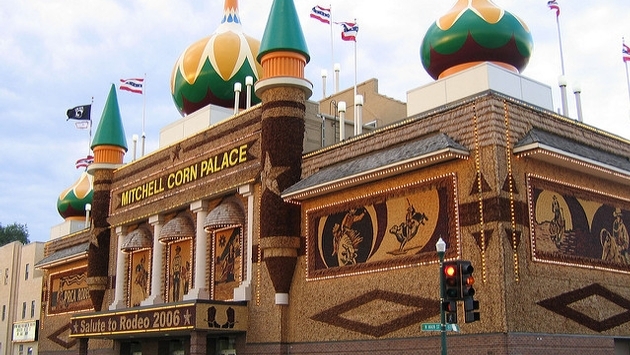 Created to show off South Dakota’s agricultural prowess, the Corn Palace, or ‘World’s Only Corn Palace’ as it's known officially, has become the place to go for both the curious and the roadside corn mural lovers among us. This distinctive onion-domed building on Main Street in Mitchell is adorned annually with murals made entirely of corn, all designed by local artists. Inside, you can view artifacts from previous murals, learn more about the history of the palace, and even attend a sporting event or convention. While it was tempting to load this list with a bunch of the ‘world’s largest things’ that live on the side of American roads, how can one really determine if the world’s largest ball of twine in Kansas is more special than, say, the world's largest chest of drawers in North Carolina? Enter the utterly unique World's Largest Collection of Smallest Versions of Largest Things, a place dedicated to the world’s smallest versions of the world’s largest roadside things (yes, you read that right). Owner Erika Nelson travels the country taking pictures of the record-breaking large things, then makes miniature versions of them to be displayed in her gallery. You definitely wouldn’t expect to see a giant patch of sand in the heart of the lush New England countryside, but that’s exactly what you’ll find at the Desert of Maine. Agricultural incompetence by farmers led to a huge exposure of glacial silt here, and for over 100 years, this sand has been one of the oddest stops off our highways, complete with camping facilities and a set of fiberglass camels. The Desert of Maine is open seasonally, so you are encouraged to check their site before departure. Boasting the world’s largest collection of prepared mustards (because why not? ), this Wisconsin museum is home to over 5,800 containers of the spicy yellow stuff. The museum offers free tastings and sells plenty of mustards from all over the world, in addition to walls full of memorabilia (think antique advertisements and vintage tins) and an educational short film shown in the, wait for it…MustardPiece Theatre.